The winter breeze has mellowed. Still cold but the numbness is manageable as compared to Beijing. I keep holding on to my knitted gloves as I feel the winds’ coldness penetrate my tropical-country delicate skin. After five hours of being seated and melodramatically viewing the landscape from the outside, changing scenery in every split of a second, we were the last ones to move out of the exit doors. We were finally at Shanghai Hongqiao Railway Station. There is no defined plan for the day since it should have been allotted to viewing the snow-capped mountains of Tunxi. But all flights were cancelled for zero visibility. Travelling by plane within mainland China is indeed unreliable. But with the assistance of the ground crew from China Southern Airlines, booked accommodations at Tunxi was likewise cancelled and refund of airline tickets were done swiftly. And the exploration shall continue. Unplanned and surprisingly awesome. The Bund is the go-to-place when in Shanghai. In whatever time of the day, the highly modern skyscrapers of Pudong along the Huangpu River is a picturesque backdrop of selfies and meditation (if there is one such purpose). The Bund is the waterfront area in central Shanghai and accessible through the Shanghai Metro Line 2 at East Nanjing Road station. The Bund actually refers to the buildings and wharves on this section of the road as well as some adjacent areas. As we walked through the Bund, prominent are the wedding photoshoots on each corner and even on the road leading to the century-old Waibadu Bridge. The Waibadu Bridge, translated as the Garden Bridge, is the first all-steel bridge and the only surviving example of camelback truss bridge in China. It is a good vantage for photography as well making the iconic Oriental Pearl Tower as backdrop. It is the Oriental Pearl Tower actually that makes the skyscraper of Shanghai unique and remarkable as compared to other skyscrapers around the world. At night, the tower is brightly lit in different LED sequences. 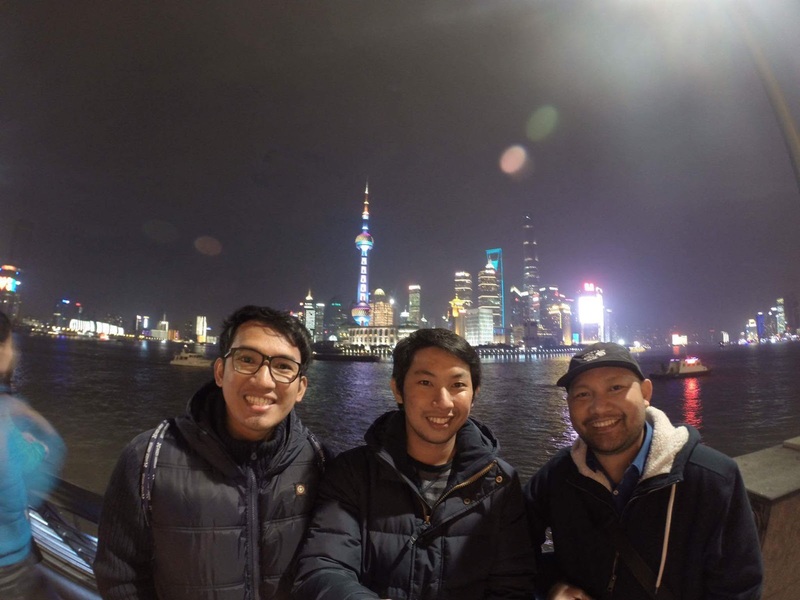 The Bund is likewise surrounded by restaurants, hotel chains and even hawker stalls that if one runs out of order for business while in Shanghai, loitering within the premises is the best option. It was indeed a long day for the first night in Shanghai. For comfort food, I could have suggested dining at familiar fast food chains and restaurants in the likes of Subway and McDonalds but really, with the short stint in Shanghai it is unbecoming of my self-imposed explorer self. We all are familiar with lumpiang shanghai. What can be more authentic than placing the same as an order for our dinner at a nearby local restaurant near the Waibadu Bridge. With some type of noodles, braised beef, spring rolls (lumpiang shanghai) and more rice, our dinner became an instant feast. The following day, our Singapore-based friend, Rodel treated us to a famous restaurant serving xiaolongbao. It is said that xiaolongbao originated in Nanxiang, a suburb of Shanghai in the Jiading District and from there it expanded into downtown Shanghai and outward. I honestly haven’t tasted the same though I’m a mainstay of Binondo (Chinatown) Manila. We were fortunate to be relatively early as the queue of diners went long approaching midday. Xiaolongbao was served in a traditional steaming basket. I actually love the soup sipped in the steamed bun. For whatever the name of the restaurant is, I do recommend the same for a dining experience while in Shanghai though the waiting time is actually longer than the dining itself. Worth the wait nevertheless. In a food tripping expedition for the morning, right across is another restaurant serving fried dumplings. And so we heeded the call and dined. I love the crispiness of the fried dumplings that goes well with soda. The street is full of scammers. But of course I learned it the hard way on my last visit to Shanghai and the gullible self that I have was guarded by my travel buddies this time. I entertain but never succumbed. When a couple or a group of Chinese students request for their picture to be taken I sometimes could’nt resist the request because I do the same favor as well but when invitations for a tea session comes in, I must dismiss further discussion. Old City of Shanghai is the traditional urban core of Shanghai, China. More than the varied stalls, shops and restaurants, there is the City God Temple connected to the famed Yuyuan Garden. The vast compound is quite interesting that apart from being a complex of souvenir shops, traditional architectural design of aligned commercial establishments is apparent. The People’s Park is our neighborhood - a walking distance from where we are staying and where stall of street foods are offered to every passer-by. But one weekend caught us by surprise. It was an interesting rendezvous at the People’s Park. That weekend will be subject to a separate blog story. For most travelers, Shanghai City is the gateway to several interesting municipalities of mainland China. It is a stopover that itinerary within the city will be shortened to make adjustments. For a 24-hour trip for instance or even less, it is important that we know where we are going to and how to spend quality time in the vibrant city of Shanghai.